Ah, Daredevil every week! 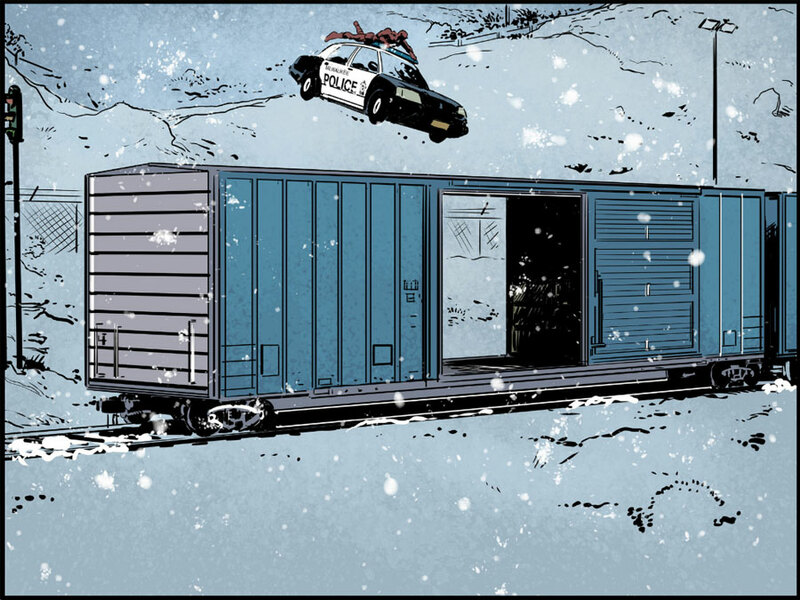 The second installment of the digital series Daredevil: Road Warrior, by Mark Waid and Peter Krause was released yesterday, and I could definitely get used to getting my regular fix every Tuesday. First off though, let me just mention how thrilled I was to see so many of the regular commenters mention (here and elsewhere) that they had decided to check this out and ended up really enjoying it. While I obviously don’t have any vested interest in whether Road Warrior ends up being hit, I will readily admit to being a fan of the digital format, and the innovation that comes with it. In that sense, seeing others take the plunge, maybe for the first time, is encouraging. There is also the Daredevil-specific aspect of it. When Marvel decides to do something special for Daredevil’s 50th anniversary, it’s rewarding to to see it be so well-received, speaking simply as a fan of the character. I hope Marvel takes this to heart. But, let’s get on to what happened this week! Daredevil: Road Warrior #1 got us going on this great and – obviously very eventful – journey, and provided a great starting point for new readers. This was true both in terms of the funny and intimate character work, as well as in the way it introduced potential newcomers to the digital medium. 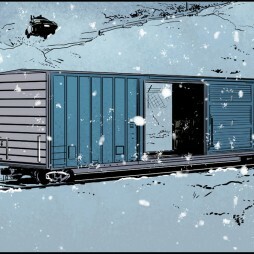 I found that Road Warrior #2 was just as enjoyable, but in very different ways. While the first chapter featured several different settings, this second chapter consists of a single long scene, and much of it is straight Daredevil action. The digital techniques used to tell it come across as a just little more subtle than what we saw last week, and it seems like the mission this time around was to stick to the basics in terms of plot while focusing on the execution. On the face of it, this is “just” a hop and a skip from cliffhanger A to cliffhanger B. 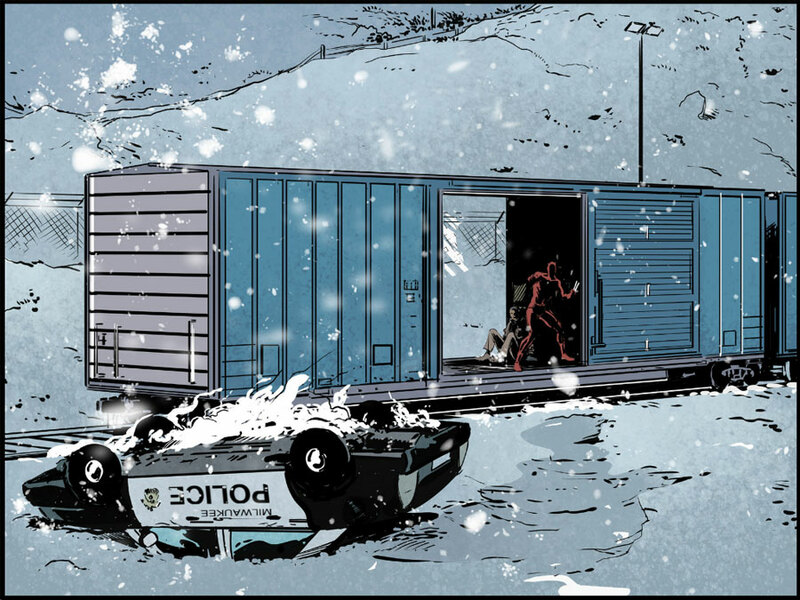 (And by “hop and skip,” I mean wild car chase through snow. 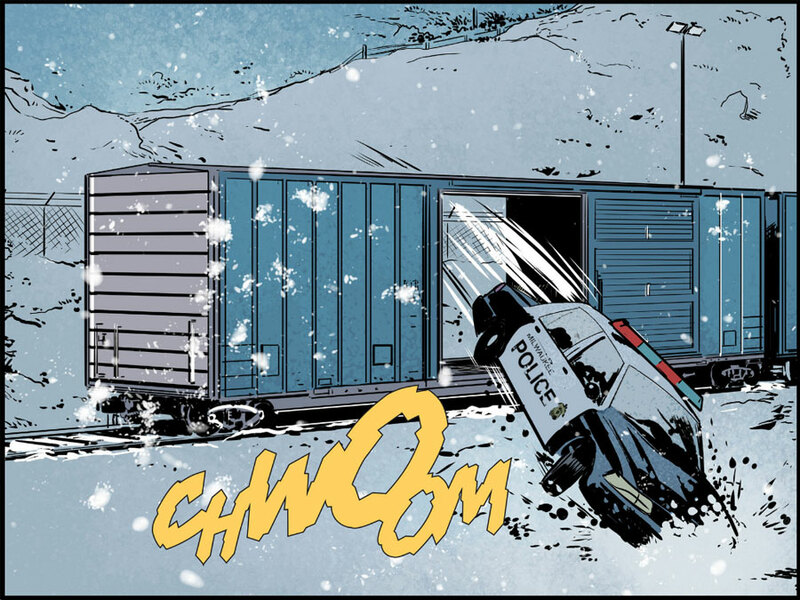 And not even the kind of car chase where the main character gets to enjoy the comfort of actually riding inside the car.) But what makes Road Warrior #2 that much more enjoyable in its simplicity is that it’s also a love letter to the character. There are so many classic Daredevil moments on display here, I had a smile on my face the whole time I was flipping through these panels. It starts with Matt’s encounter with the police in the men’s room, which provides us with the “harmless blind man fools everyone” trope. Next we have the equally timeless “costume change in mid-air,” executed with such speed that it’s impossible not to smile at the obvious whimsy at play. Then there’s the “Daredevil versus the elements factor” at play, which serves to challenge – though not defeat! – our intrepid hero, who cleverly isolates his target. Though not before said target has managed to steal a car and drive off, which brings us another classic: Daredevil clinging to a runaway vehicle for dear life. While not unique to Daredevil, this kind of man versus machine scenario is, and has always been, a great way to highlight the raw determination that is so central to the character. There is no superhuman strength, no healing factor, and no armor. And yet, Matt Murdock is one stubborn guy with seriously impressive grip strength. In the middle of this thrill of a ride – and hey, there are even spy movie type bad guys on motorcycles! 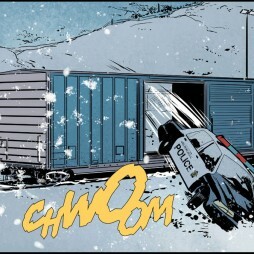 – Waid also makes sure to remind us of Matt’s lawyer side, the one that relies on persuasion, and establishing trust. In his attempt to reason with the stranger, we sense great urgency, but there is also the mix of authority and empathy that you might associate with rescue workers. Daredevil’s voice throughout the entire story has been absolutely spot on. I find myself enjoying Peter Krause’s art even more this week. 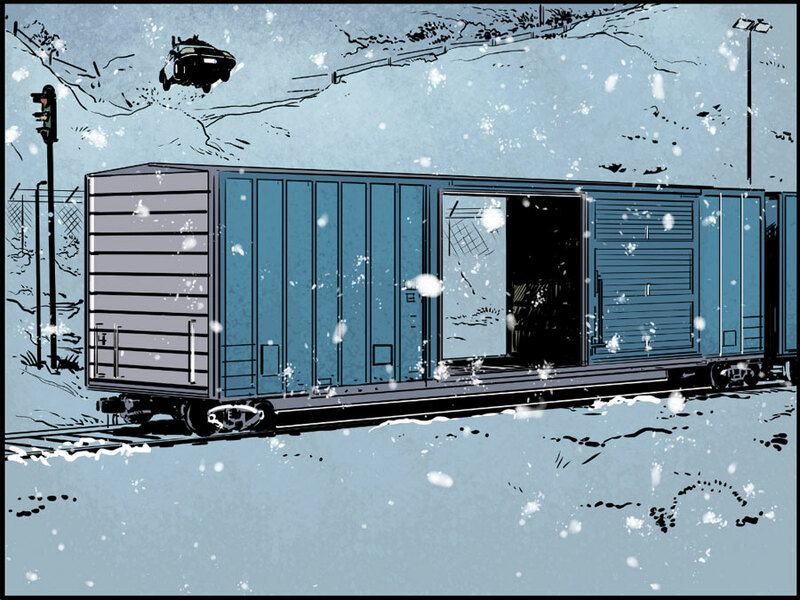 His style seems like an even better fit for the kind of grand, snow-covered vistas we’re treated to in Daredevil: Road Warrior #2, and his rendition of Daredevil is pretty darn near perfect. All those classic moments I talked about? Krause’s take on these moments is a big part of their timelessness. The action scenes are perfect, you can sense the frenzy and great forces at work, and the quieter scenes have a perfect tension to them. 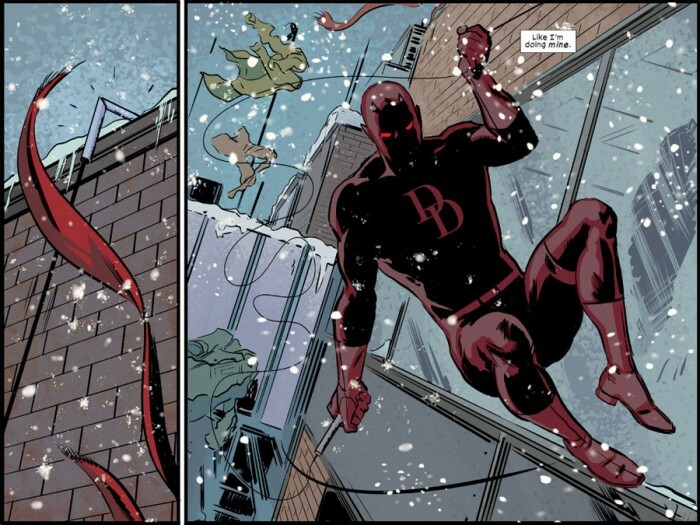 I would love to see Krause return to some other Daredevil project at some point. This chapter turns the dial up on the mystery introduced last issue, and my only concern is that Daredevil won’t actually make it to San Francisco! 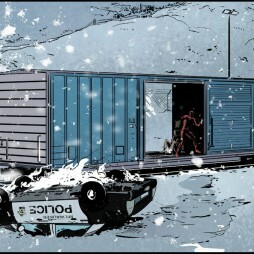 Though I’m sure that Waid & Co. probably have that detail taken care of. 😉 I can’t wait for more of this next week! I liked it. Kraus is probably not my favorite artist of all time, but I generally enjoyed it. The art feels closer to what Klaus Jansen would do (as penciller AND inker), although at times it feels very “loose” and it’s hard to pin down his style, which can seem to vary from frame to frame. The storytelling in this format has a kind of urgency to it that the monthly DD does not. it almost feels like I’m watching a TV show. Sweet issue. I could get used to a weekly DD comic. 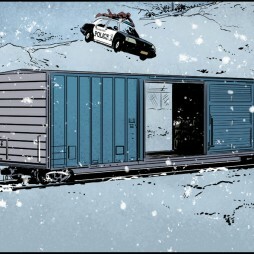 I notice the change in pace much more w/ weekly releases.last issue felt like a character driven indie movie. This is has a Die Hard action movie vibe (altho only the first two Die Hards, please). And guys, you gotta read the revamped Moon Knight.